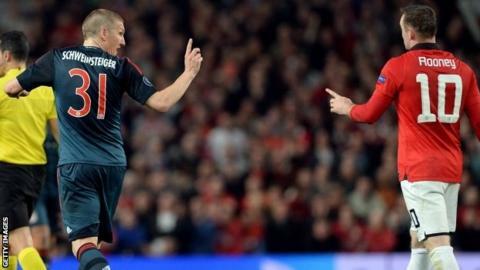 Wayne Rooney has defended himself from accusations that he dived to get Bastian Schweinsteiger sent off during Manchester United's Champions League last-eight match against Bayern Munich. Schweinsteiger, who is banned for the return leg with the tie poised at 1-1, appeared to make a diving gesture, as did his coach Pep Guardiola. "It was a very, very good performance by United. There were a lot of positives to take for David Moyes. "I think United could actually be disappointed with a draw, based on chances created. Bayern had all the possession but they didn't really create an awful lot. The problem though is that away goal. "The Germans might be without players for the second leg but they have got quality players to come in. "United have got a chance because in the centre-back area Bayern are vulnerable. We saw it at Arsenal and we have seen it again - they don't like the ball over the top." "I thought it was a foul," the United striker said. "If I didn't get out of the way he could have hurt me. "I didn't try to get him sent off." Rooney added: "He's gone in with his studs and the referee has booked him, so it's not my decision. "He's a great player and he's obviously someone they will miss - and Javi Martinez as well being suspended - but they have a great squad of players who can come in." When asked if he agreed with referee Carlos Velasco Carballo's decision to show his player a second yellow, Guardiola said: "Absolutely not. "He is a very good referee. He made a very, very good game, but it is unfair. "To win the Champions League you have to solve and overcome everything. In football this kind of thing happens." United defender Nemanja Vidic opened the scoring in the second half with a header from Rooney's corner before Schweinsteiger equalised with a powerful close-range strike. The Germany midfielder was then shown a second yellow in the final minute of normal time. "We'll go toe-to-toe with them," said United boss David Moyes said of Wednesday's second leg in Munich. "Our best football has been in this competition, and we will need to show our best football when we go to Bayern next week."